East Wall at the Tower of London. Photo: Richard Leahair. 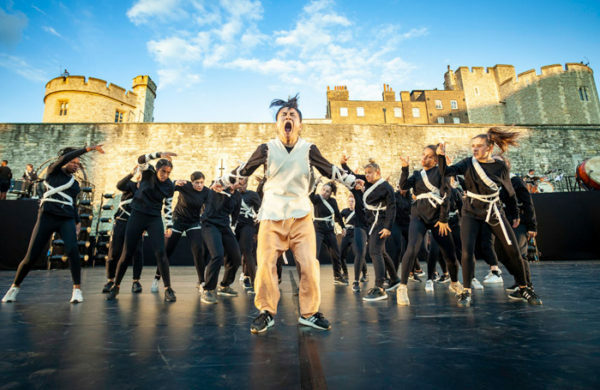 Four years in the making, eight youth groups, four emerging choreographers, one giant of the dance world and, of course, a lot of drums: pour them into a moat outside the Tower of London and you have East Wall: Storm the Tower. Directed by Hofesh Shechter as part of a collaboration between East London Dance, Hofesh Shechter company, Historic Royal Palaces and LIFT, East Wall has all the hallmarks of a charming, tagline-led, photogenic community project that would mark the edgier part of a summer theatre schedule half-filled with Proms. The outdoor champagne bar, the boutique-festival food, the sanitised historic backdrop, all seemed to point to a Nice Evening Out. Imagine, then, the giddy, visceral thrill of actually experiencing East Wall – five explosive, creative, passionate, stirring dance pieces that spoke directly to the unsanitised, often frightening, history of East London and the Tower. The set-up doesn’t suggest that four emerging choreographers, and Shechter himself, are about to deliver a roundhouse kick to expectations. On one of the raised platforms on the enormous stage, a choir melismas their way through ‘Space Odyssey’, and a fully liveried brass band (the Band of the Irish Guards) come marching round the corner and across the stage. So far, so high-production private school summer fête. Running with ideas of royal dominance and simmering revolution comes James Finnemore’s piece, featuring Incognito Dance Company and Shift Dance Company. A severe queen-like figure appears to go from being carried and pampered by a subservient court to being imprisoned, manipulated and observed by a republican collective, using exactly the same phrases but with subtle differences in energy – can we really call her a ruler, and can we really call those around her the ruled? One breath-taking scene sees a semi-circle of dancers dipping their heads and bodies in facsimiles of deference, but they fix the queen in a single confrontational stare. Finnemore’s movement vocabulary is pared back to a ritualistic austerity, and the electrifying precision of the piece tells stories of tension, fear and uneasy balance in just the incline of a head. Duwane Taylor’s piece, featuring One Youth Dance and University of East London Dance Collective, takes the tension and turns it inside out with an exhilarating show-stopper that has the audience whooping. Black-clad performers with white fabric cuffs and bandoliers face the audience in an approximation of army ranks, shouting and challenging us. Thunderous, stamping rhythms and the quality of a tamed tsunami evoke the raw fury of an attacking force – though whether they are here to bring the Tower down or defend it, we do not know. Sparking off courtly dance, with a deep lyricism and a delicate sense of exploration, Becky Namgaud’s piece, featuring Cando2 Youth Dance Company, Elevate Dance Company and One Youth Dance, has a quiet delicacy. Filled with graceful shapes and a keen eye for the sculptural – it finishes with a dance being carried of the stage and undulated like a wave – it has a fairytale quality even when the narrative is not always clear. The final piece, Hofesh Shechter’s, featuring the youth company Shechter II, is horrible and brilliant. The Dancers of Shechter II are court jesters, clad in a slapdash variety of clownish costumes, and their heavy skips, flopping limbs and atavistic crouches speak of – ironically – performers exhausted by the work of performing. But things turn violent, and soon the clowns are miming stabbing, choking and shooting one another, only for their wretched corpses to reincarnate and begin the terrible dance again. It’s almost a play within a play; it’s the intrigues of court politics, the scheming and the brutal executions at the Tower, as presented by the court jesters, who in turn have to kill one another to keep their bloodthirsty audience interested. Far exceeding expectations, East Wall is a celebration of the blood and guts of stories around the Tower and East London. There’s no sugarcoating and no sense that the celebration should turn away from the dark and tumultuous – tumult and darkness are embraced, narrated, and boldly shown. East Wall was on as part of LIFT 2018. Click here for more details.